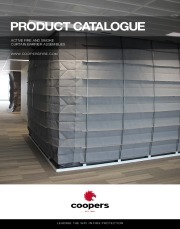 About Coopers Fire Ltd. - Products, News and Contacts. 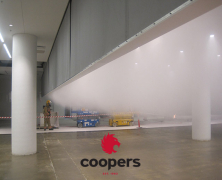 Coopers Fire are dedicated to advancing fire curtain and smoke curtain technology and improving ways to safeguard life and property. This commitment to developing products, testing and certification has meant that Coopers Fire is the benchmark used by Architects, Engineers and Regulators worldwide. From architectural masterpieces like the Shard and Gherkin to iconic buildings such as Sydney Opera House and Buckingham Palace, for over 30 years, Coopers fire and smoke curtains have been trusted to protect the world’s most prestigious buildings and their occupants from fire. 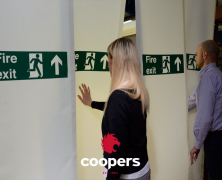 At Coopers, we’re proud of the fact that every fire and smoke curtain and their key components are manufactured within the Cooper Group of Companies to ISO 9001 and ISO 14001 at our manufacturing plants in the United Kingdom. 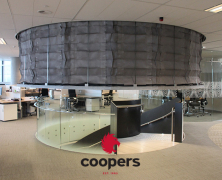 The multisided FireMaster® Concertina fire curtain manufactured and developed by Coopers Fire. It is a self-supporting fire curtain, removing the need for visible columns and supports to achieve absolute open plan design. 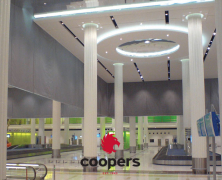 The FireMaster® active fire curtain barrier has been developed by Coopers Fire to protect all vertical applications. 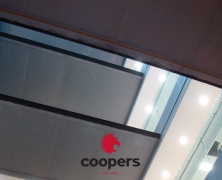 Coopers commitment to advancing smoke curtain technology has led us to develop a wide range of BS, EN and now UL tested smoke curtains that enable designers to create open plan environments by replacing smoke-rated walls, bulkheads, glazing and down stands with approved smoke curtains. 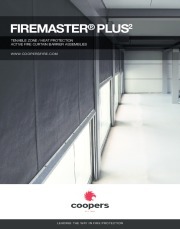 From airports to domestic houses, the FireMaster® Plus² has been developed by Coopers Fire to protect all building types and can be applied to protect most vertical applications. Domestic fire curtains are providing homeowners with the means to achieve beautiful open plan living without compromising fire regulations. 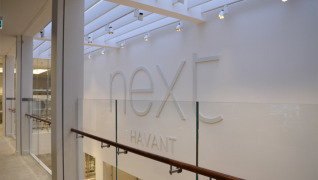 Preventing smoke from migrating through stairwells, skylights and ceiling voids to additional floors and areas of a building can be difficult and often leads to designs being compromised to meet fire regulations. The SmokeStop evacU8 active “WALKTHRU” is CE Marked and Third Party Certified to provide cross corridor protection whilst allowing occupants to egress on mass. Supplied with Coopers Total Gravity Fail Safe (TGFS) system, smoke control, warning system, variable speed and controlled descent. 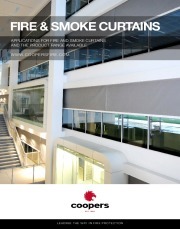 Coopers Fire offer a standard range of fire curtains and smoke curtains tested to BS EN and UL standards. Our range branches into vertical fire and smoke curtain products (FireMaster and SmokeStop), horizontal fire curtain products (FireMaster Horizontal), multi-sided fire and smoke curtain products (FireMaster Concertina) and angled fire curtain products. Coopers can of course also design a bespoke product where required. 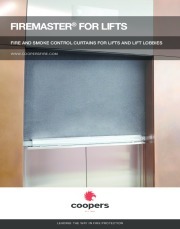 Coopers Fire are manufacturers of fully tested and compliant Smoke and Fire Curtains. 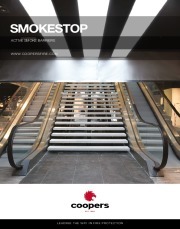 Download their Smoke and Fire curtains brochure to get an insight into who Coopers Fire are and the product range they offer. 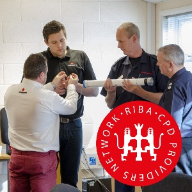 Smoke management is complex and can often impact on your building’s aesthetics and interior designs. 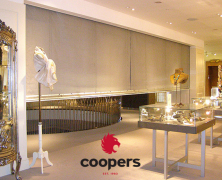 At Coopers Fire, our commitment to advancing smoke curtain technology has led us to develop a wide range of BS, EN and tested to UL standard smoke curtains that enable designers to create open plan environments by replacing smoke-rated walls, bulkheads, glazing and down stands with approved smoke curtains. Our commitment to advancing fire protection technology led our R&D team to develop the groundbreaking FireMaster® Concertina™ fire curtain and the world’s first self-supporting fire curtain, removing the need for visible columns and supports to achieve absolute open plan design. 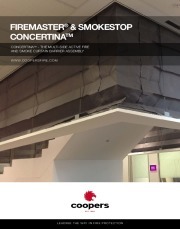 Third Party Accredited to provide 4 hours protection from fire, the unique FireMaster® Concertina™ provides designers with the means to create modern, open plan atria, offices and retail environments by replacing non-loadbearing firewalls, fire shutters, un-insulated glazing and sprinklers. 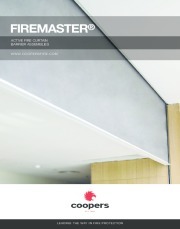 Developed to fit all manner of applications, every FireMaster® Concertina™ uniquely tailored and is manufactured to fit L shapes, curves, squares and rectangles, trapezoid and multi-sided faceted circles. Fire curtains with smoke control over a lift opening offer fire integrity and prevent smoke from spreading through the building via the lift shaft in the event of a fire on any of the building’s floors. 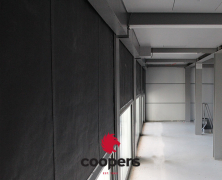 Coopers installed FireMaster fire curtains over the lift door openings on each of the ground and upper seven floors and two on the basement so a total of forty eight curtains. 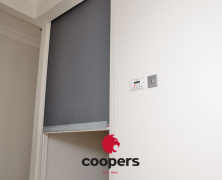 The BS 8524 compliant FireMaster active fire curtain barrier has been developed to work with all building types, including domestic houses and is supplied with the Coopers Total Gravity Fail Safe (TGFS) system and features variable speed, controlled descent, limits radiation, smoke leakage, emergency egress and side channels. Available in widths up to 30 meters with a drop of 6 meters, the FireMaster Plus² is supplied with the Coopers Total Gravity Fail Safe system (TGFS), insulation zone, variable speeds, side channels, smoke leakage, emergency egress and controlled descent. With fixing options to suit all types of ceiling configurations, the FireMaster Plus² fire curtain can be integrated with both solid and suspended ceilings and will remain hidden within the ceiling until deployed. The Coopers Fire FireMaster® Concertina™ Fire curtain installed around feature staircase in the new Nova building in Victoria, London. The circular Concertina fire curtain offers up to 3 hours fire resistance and can be used to allow open plan building designs. It is available in various shapes from rectangular to circular and does not require side guides or columns so is completely hidden from view until deployed. FOR MORE INFORMATION CONTACT COOPERS FIRE LTD.